KVS Officers Cadre, Non Teaching Posts 2017 Recruitment, Apply online: Kendriya Vidyalaya Sangethan (KVS) is an autonomous organization under the Ministry of Human Resource Development, Government of Ind has issued a direct recruitment notification on 18-12-2017 and the KVS invites Online applications from the eligible Indian Citizens for filling up the Officers' Cadre and Non-Teaching posts to be filled up by direct recruitment. 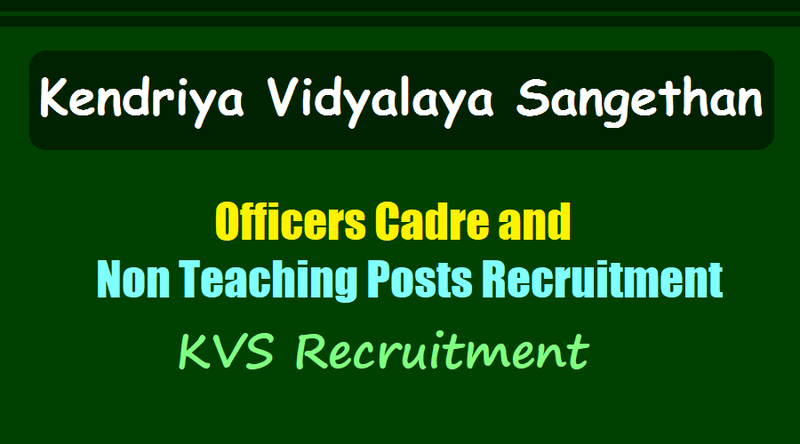 Kendriya Vidyalaya Sangathan (KVS) has notified recruitment for 1017 vacancies. Application submission process for the recruitment will begin on 21 December 2017. Meanwhile, interested candidates should note that, a similar recruitment was conducted by KVS in May 2015; candidates who had applied then need not apply again. But such candidates shall have to update their information incase there is any change in the address of communication, email ID, mobile number. Even those who want to change the exam centre choice can do it now. For those candidates who had applied through 2015 recruitment, the eligibility criteria will be decided on the basis of earlier applications submitted by them in response to earlier advertisement. Candidates with postgraduate, graduate and class 12 pass qualification are eligible to apply for the posts. Working knowledge in Hindi and English, knowledge of computer application, typing speed will be added advantages. Written exam will be held at 76 centres across the nation. Educational Qualification: Candidates should possess second class Masters Degree, B.Ed or equivalent Degree, 5 years regular service as Assistant Commissioner for Post 1, Masters Degree, B.Ed or equivalent Degree for Post 2, Graduation for Post 3, B.Com with 50% of marks in the aggregate and at least 4 years post qualification/ M.Com with 50% of marks/ CA (Inter)/ ICWA (Inter)/ MBA (Finance) or PGDM (Finance) with knowledge of computer applications for Post 4, Graduation/ Diploma in Electrical Engineering for Post 5, Graduation for Post 6 from a recognized institute with relevant experience.